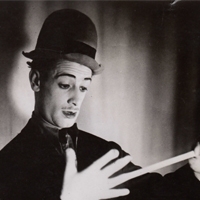 Born in Leeds in 1910, the only son of a theatrical family, Johnnie was destined for a life in entertainment. At 15 he joined an acrobatic stilt walking act, The Pender Troup of Giants, that also had a member Cary Grant with whom Johnnie kept in touch up to the time Cary died. Progressing from acrobat to dancer then solo comedian in the early 30's he went to Holland and stayed for 5 years becoming a big star there and also learnt several languages. Soon the dark clouds of war curtailed Johnnies ambitions for international stardom and with a rare act of appropriate casting the war office dispatched him to the Intelligence Corps. Even Hitler failed to thwart his fanatical joint loves - golf and the smell of greasepaint. Around this time another love entered his life - Violet Terry his wife of many years, with Vie he formed one half of a successful comedy duo working on the radio and and in the music halls regularly. After the war there was again an opportunity to re-establish his activities with the senior show-business golfing Society of the time The Vaudeville Golfing Society of which he was Captain twice. From 1945 Johnnie saw his professional future lay more in the role of theatrical agent so the marriage between golf and the stars entered a most blissful period. PKR Johnnie was instrumental in organising many golf pro-am events and raising many thousands of pounds for charity in the process, he was the golf organiser for 16 years for the Variety Club of Great Britain Golfing Society from 1970-1986, during this time he helped raise over 1.5 million pounds for the purchase of Sunshine Coaches. Johnnie Riscoe became King Rat in 1959. When he answered the phone and anyone asked if that was Johnnie Riscoe he used to say "Yes, there's only one and will never be another" - so true!!!! Sadly missed by all those that knew him.